So, you had downloaded a movie to your computer or got it from elsewhere. Actually, the movie is in the foreign language, so it is quite obvious that you may not understand the movie because of not your own language. In this case you need a movie having embed subtitles within, so you will understand it clearly and easily. As you know that, watching movies without understanding it is just waste of time and is not entertaining one, so you need to add subtitle to this video or movie you are watching. For such task many others may suggest any other way of embeding subtitles in a video but let me tell you that you can add subtitles to a video using VLC media player. VLC media player is one of the best and famous media players which plays almost all types of video files. Along with playing movies and videos on your computer, VLC is now also available for your android mobile phone. Apart from playing your videos, it comes with some features which will easily do your work without putting you in any difficulty and downloading/installing other software for performing such task. Well, without wasting your time and getting you bored while writing anymore, i would like to get started with the today's tutorial and show you the method to embed subtitles to a video using the vlc media player. 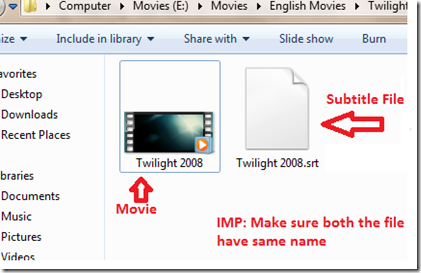 Here are 3 different ways we discovered for adding subtitles in vlc player. Before diving straight to the topic, i would like to give some suggestions to those, were unable to find the subtitles for a movie, I suggest them to search for the subtitles for your movie using any of the these below websites. I hope in the above websites, you will be able to find the subtitles for your movie by searching for it. Once you had found it download it to your computer and proceed further. This method is very easy and is straight forward. What you have to do is to download the subtitle or if have downloaded already, place that file in the same folder where the video is. Also keep the subtitle file name same as the video. Next to play the video with subtitle, launch VLC and play that video file. 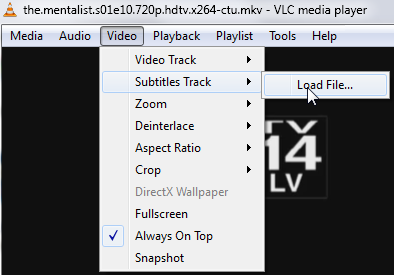 VLC media player will automatically load the subtitle with the video. Another way of embeding texts to the video is to be done using the "advanced open file" feature in vlc media player. 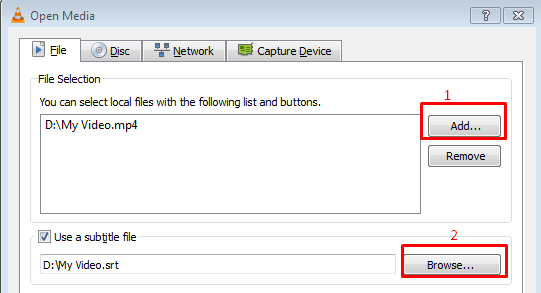 To add a subtitle, click on "MEDIA" from the top navigation bar of the vlc media player and select the appropriate "Open Multiple Files", first select the video file by clicking on "Add" button and then tick the "use subtitle file" and browse your computer to add the subtitle file. Look at the below screenshot for better understanding. If you are using the old version of VLC media player and can't found the subtitle tab at the top navigation bar of the player, yo proceed as below in order to embed the subtitle. In older version of VLC media player, click on "Video" tab, under it select "Subtitles track" and then click on "Load file". After clicking on this, browse the subtitle file from your computer and you have done everything needed. That's it dear friends, I hope you liked the above tutorials and you understand the methods that we shared through this post, I concludes that from now you will be able to add subtitles to your movies, videos or TV show you want.